Wonder Woman just had a record-setting opening weekend. While everyone was at the theater watching her, the woman who plays the Amazonian warrior princess, Gal Gadot, got into a back-and-forth on Twitter with the Asgardian God of Thunder over a question comics fans have debated for years: Who would win in a fight, Wonder Woman or Thor? Might there be some sexual tension building here between the two breathtakingly beautiful actors gods? Gadot’s idea of colliding the Marvel and DC worlds on-screen is surely something fans would drool over, but sadly not something that’s all that feasible, given the whole rival-studios-competing thing. Then again, comics readers went decades yearning for DC and Marvel to put aside their differences and finally answer the question of who’d win if various heroes from the two universes met head-to-head. In a four-issue special series in 1996, the two comics giants did just that, in the epic DC vs. Marvel Comics (clever name, guys). Storm went on to win that fight, one of the five major DC vs. Marvel battles. The others were Superman defeating Hulk, Batman overcoming Captain America (sort of), Spider-Man beating Superboy, and Wolverine finishing off Lobo. 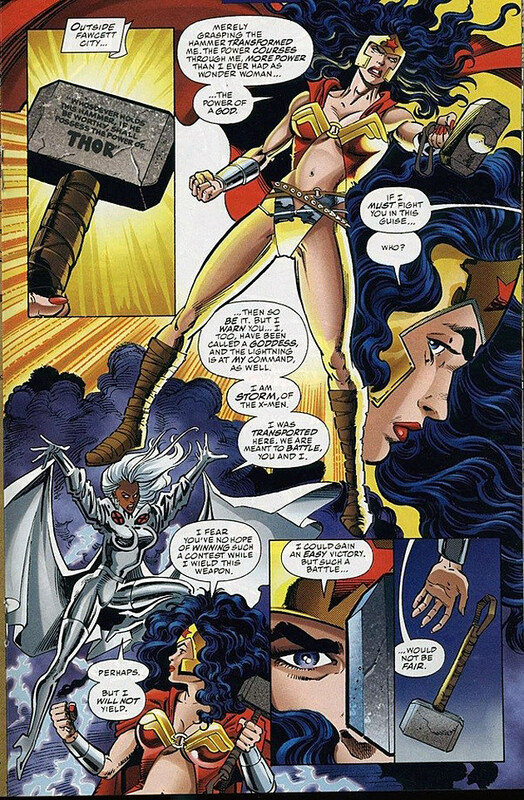 Thor’s melee with Captain Marvel (not that Captain Marvel) was a kind of undercard match, which Thor won. Like we said, we aren’t likely to see a cinematic version of this anytime soon (if ever), but that’s no reason not to start turning up the pressure on the studios. Besides, we’re only four short years away from DC vs. Marvel’s 25-year anniversary. Perhaps by then public demand will win out, and we’ll get to see some of those battles a lot of us have already been dreaming about. And not just the obvious ones, like the aforementioned Superman vs. Hulk. Are you telling us an Iron Man vs. Batman movie wouldn’t shatter some box-office records? We’re thinking $300 million opening weekend. Somebody get Joss Whedon on the phone.